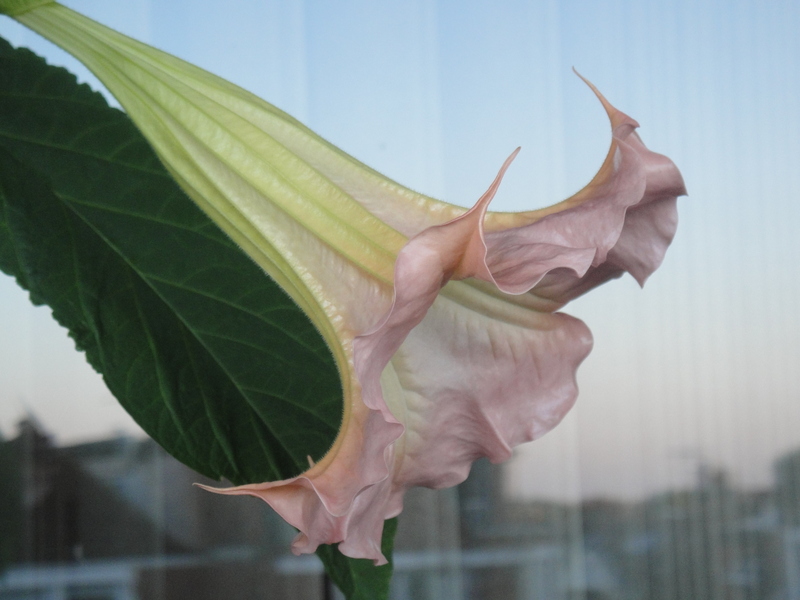 In my July post, My urban balcony garden (which was so spectacularly well received after being featured on “Freshly Pressed” – thanks everyone for the generous comments and feedback), I promised that once my favourite plant – my Brugmansia, came into bloom, I’d get it up on my blog asap. The beauty of a garden, even the smallest and most controlled of little urban gardens such as mine, is the power of the seasons and the relentless passing of time to change the shape, colour, fragrance and feel of a garden as plants grow and recede, flowers bloom and shrivel, insects come and go and leaves grow and fall. 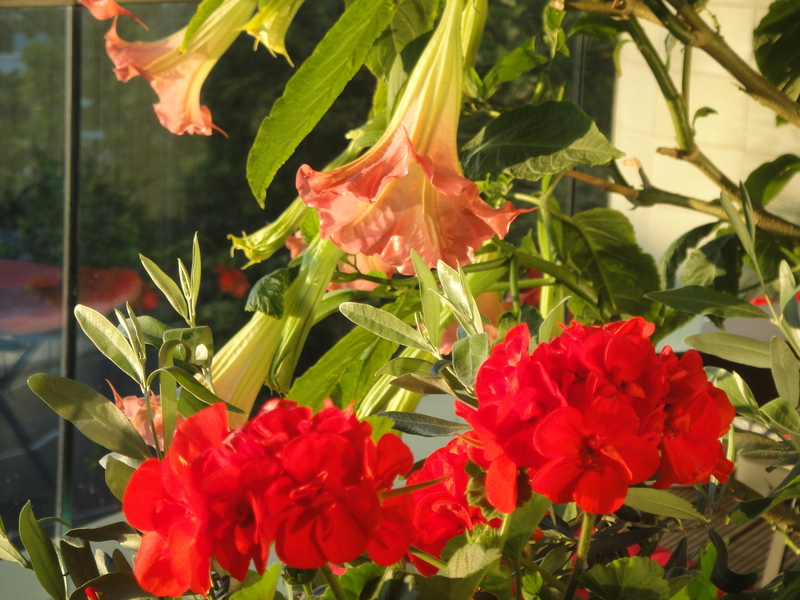 No greater is this change felt on my balcony than the time in mid summer when my Brugmansia bursts into a cornucopia of sunset pink flowers. The plant, which is a native South American plant but which I first saw in the carefully tended gardens of Sunny Marbella (in a Southern Spain), is an absolute stunner which is not exactly common in England. In fact the only other time I’ve seen one here has been inside the greenhouses of Kew Gardens. However somehow, perhaps because some kind of green-fingered god is waving his wand over my balcony, my Brugmansia, which resides outside subjected to the seasonal capriciousness of London’s weather, has survived the six years since I moved into the flat, and has given me a spectacular bloom year after year. The plant does not flower for long (generally two cycles, once around July-August and again around October-November) but when it does, it is utterly spectacular. The plant almost doubles in size and at any one time can display around 50 huge trumpet-like flowers. The blooms are incredible. They start off a creamy white, and as the first evening of their life draws on, the end of the flower becomes gradually pinker, like an ombre sunset design. They really are summer flowers, since they are at their best in the evenings – by day time they hang fairly limply, but at night the open wide and strong, aiming to attract night time insects with their colour and their fragrance. Oh that perfume, that smell! – if only this blog had the power to transpose it. The perfume wafting from these flowers on a warm summer’s evening is exquisite. Like lemon and jasmine all rolled into one. It’s incredible. So when capturing the flowers for my post as promised, I had to get up at 5am, at the first light of dawn, to photograph the blooms open but in good light. The results are glorious, as the warm golden early morning sun brings out the potency of pink in the flower and the luscious verdant green of the leaves. My urban balcony garden never looks better than when its Brugmansia blooms. Take a look at my little slice of the tropics in London. Sadly, you’ll have to imagine the smell. All photos are strictly the copyright of Nicholas de Lacy-Brown © 2012 and The Daily Norm. All rights are reserved. What a beautiful plant – beautiful blooms. 🙂 I thought at first it was a Datura. The colour (and part of it’s form, though not the trumpet shape) has something in common with Hibiscus. There’s one in our sitting room – huge blooms, very similar in many ways to this. 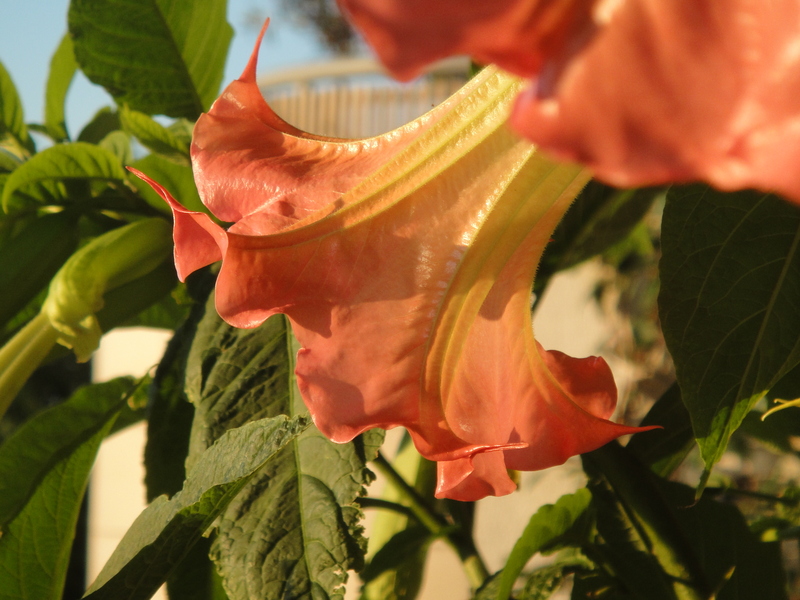 According to wikipedia, Daturas and Brugmansias are very closely related – both incredible plants. Mines got a whole round of new flowers just about to pop out so longing forward to a highly scented weekend!